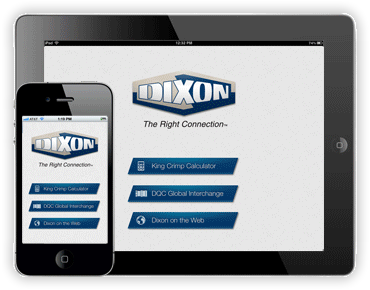 This app features our King Crimp calculator, Dixon Quick Coupling Global Interchange and Dixon on the Web. The King Crimp Calculator allows the user to enter hose dimensions with a resulting crimp diameter and corresponding sleeve, ferrule and fitting part numbers all linked to the product's specification page on the Dixon website. 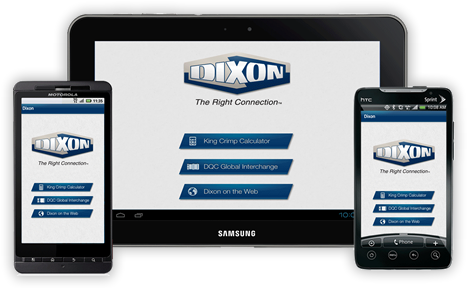 The Dixon Quick Coupling Global Interchange allows the user to quickly cross-reference Dixon Quick Coupling part numbers with those of other manufacturers.